How safe is your car? Get government crash test ratings for hundreds of vehicles. Find the right weather-ready vehicle with the help expert advice. Get the commute forecast for your location, and traffic reports for over 20 cities. 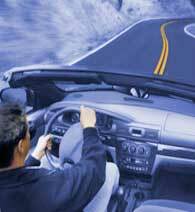 Avoid dangerous driving conditions along your route. How much to fuel up? Check fuel efficiency and environmental ratings. Find crash test ratings for hundreds of vehicles. It's not the destination, it's the journey. Check out our guides. Get help choosing a weather-ready vehicle. Learn ways to turn any car into a green driving machine.